When Tuesday went by without the regular maintenance I figured that patch 1.4 was still several weeks away. Then suddenly... surprise patch on Wednesday! Why does extended maintenance always have to happen on my day off? Oh that's right, it's one of the great unwritten laws of MMOs (and possibly life). TOR also still lives by the old mantra that patch days always break about as many things as they fix, with the biggest casualty this time around being the GTN, which has simply been completely non-functional since the patch's deployment. If I was a big trader, that would drive me nuts. As it is, my augments can wait. Personally I was more concerned about the fact that my game crashed three times in as many hours. However, I'm hopeful that these are the kinds of problems that will be ironed out within a day or two. Once I actually got to play, I immediately threw myself into some PvP. On my Commando I trained my new interrupt and then cackled with glee every time I got to use it, even if my interrupting didn't actually make any difference to the fight. As far as the other class and balance changes went, I found it too early to really tell whether they had any major effects. My Sage had some trouble aiming her revamped Force Wave sometimes, but that's probably just a matter of getting used to it. And it didn't feel like I spent any more time in stuns than before. The only thing that I found noticeable was that in the few Huttball games that I played, people seemed to have a lot more trouble stopping the ball carrier from a distance than they did before, which would be in line with my predictions about the reduced range on most stuns. I was happy to see the warzone daily requirement being lowered from six games played (or three wins) to four games played (or two wins), as this should allow me to do the daily on more characters within a shorter amount of time. Since this resulted in me getting my usual dailies done more quickly, I also checked in on my lesser played and geared Guardian and Operative. On them I was a bit disappointed to see that those of us who took the previous set of free Recruit gear from the PvP terminal don't get an option to swap it for the new MK-2 version. I don't really feel like spending several hundred thousand credits on gear that I expect to replace soon and that new fifties will get for free now. I'll just have to be squishy for a little longer. Battlemaster gear is not far off and will be better anyway. 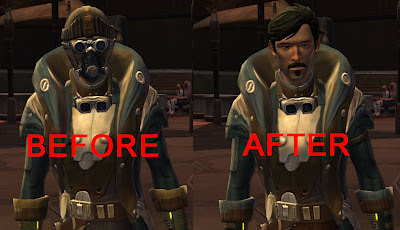 I had almost forgotten about my initial glee about the announcement that 1.4 would improve the quality of the in-game shadows, but when a guildie reminded me I immediately looked down, and the new system is definitely so much better. Actually this image hardly does the change any justice even if you maximise it, because I had to shrink the shot on the left so that you can't really see just how freaking pixellated that shadow was. It was awful. The new system is so much better. Speaking of forgetting about things, I also can't believe that I didn't immediately remember about the new companion customisation options. Once I did, I immediately checked on all of my main characters and "updated" all of their companions. As far as the companions wearing trooper gear were concerned, I had almost forgotten what some of them looked like under their ugly helmets. As far as operations go, I guess it'll be time to make a decision soon. I do want to see Terror from Beyond eventually, but just how badly do I want to see it now? I don't mind the customization options for companions, but really, Corso looks better with his helmet on. My guild jumped into Terror from Beyond last night as it is one of 2 of our scheduled raid nights and we decided to give it a shot. First, it seems that they have gone back to story mode being story mode. We only raid for 2 hours and we managed to down 2 bosses and this was with 2 DPS pugs. Second I did not notice any bugs so far. Third all though the 2 bosses we downed didnt drop any gear that could be used by anyone in our group, the mobs and bosses drop generous amounts of credits. Overall I really like the new Op and I am looking forward to Friday night when we can take down the last 3 bosses. Forgot about the shadows but I did spend a while messing around with Moods and decided I couldn't differentiate between a lot of them. Although the "Surprised" look made my trooper look like a Fembot. Companion colour co-ordination and helmet toggle were good though. Little things! I definatly want to run ops at some point. 1.4 has not added a lot for me but I still have plenty to do when I log on. Unfortunately I also suffer from not-so-micro stuttering since the patch - with makes the Lord Draaargh! fight on my warrior unbeatable. Which is frustrating, as I want to finish her class story!